Charles Robert “Chuck” Henry is a journalist and newscaster. 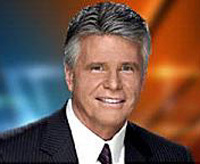 He has co-anchored the KNBC-TV newscasts in California since 1994. For nineteen years prior, he worked as a reporter, anchor, director, and producer for KABC-TV. Henry was born in Los Angeles, California, on January 1, 1946. After earning his broadcasting degree, he worked for KHVH-TV in Honolulu, Hawaii, from 1966 to 1971 and KENI-TV in Anchorage, Alaska, from 1967 to 1968. He was a reporter and anchor at WMAQ-TV in Chicago from 1978 to 1982. He is the host and executive producer of the Emmy-award winning "Travel Café" and has traveled to every country in the world highlighting food and travel. He has also hosted and produced the travel magazine program "Eye on L.A."
Some of his well-known, exclusive work includes his report from the Nevada Test Site, the Los Angeles Good Shepherd Shelter to expose the plight of domestic violence victims, and Grauman’s Chinese Theater to show the original footprints of film luminaries Mary Pickford and Douglas Fairbanks and showman Sid Grauman—all owner’s of the theater. He gained national attention in 2003 when he and his cameraman were unable to leave a forest fire because of a sudden wind direction change. They were rescued by the Los Angeles Fire Department. He is the recipient of numerous honors and awards, including LA-area Emmys, Golden Mike Awards, Los Angeles Press Club Awards, and a national Cable Ace Award. Henry hosted the short-lived 1989 game show "Now You See It" and a 1975 pilot revival of "Beat the Odds." He appeared as a newscaster in movies The North Avenue Irregulars and Wisdom. He was also in The Tommyknockers. Henry and his wife, Kay, are the parents of four children. This page was last edited on 26 February 2015, at 15:24.